Ron Paul has a point, but so do his opponents. 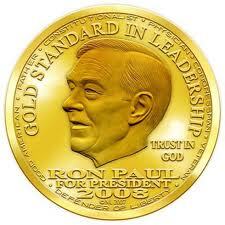 Ron Paul's most notorious meme is his desire to shut down the Federal Reserve Bank, or "Fed," and return to the gold standard for our money. He points out rightly that modern government can create all the money it wants simply by saying so, with no underlying reality whatsoever. The central bank in Europe recently bought billions of euros worth of underwater bonds from banks all over Europe. Where did it get the money? The bank simply ran the virtual electronic printing press until nobody wanted any more money. Mr. Paul's point is that the government can't do that when money has to be backed by gold. If there can only be as many dollars or euros as are represented by gold in a vault somewhere, the government can't conjure money out of thin air. Money has to be based on real value genuinely created or extracted; on a gold standard, money is no longer a government plaything but a hard currency solidly based in truth. We yield to no one in the strength of our desire to not have government steal from us, which is exactly what inflation does. However, there are a several non-obvious complexities that make a return to the gold standard exceedingly unlikely regardless of Paulite enthusiasm. The gold standard is highly desirable from the point of view of anyone who already has money. Whenever the government runs the printing presses, the increased supply of money makes money less valuable in comparison to other commodities - when the supply of money goes up, the value of money goes down. When the value of money goes down, the price of everything else goes up. We call this "inflation." If there's inflation going on, you have to increase your wealth faster than inflation just to stay even. Anyone who has money hates inflation because it takes work just to maintain the amount of money you have. Not only that, when the value of something you have goes up, you have to pay taxes on the increase, even if all you did was stay even with inflation. The combination of inflation and capital gains taxes on fictitious profits means you have to work all that much harder just to stay even. That's why people with money like the gold standard - their money keeps its value. What about the vast majority of us, those who don't have much net worth? People who don't have money but would like to don't like the gold standard because it binds them to their debts. In the past, the only way to get seriously rich was to start a business, and starting a business almost always required borrowed money. An enforced gold standard created a "tight money" situation where there simply wasn't enough money to go around. Remember, if each dollar has to be backed by a gold bar in Ft. Knox, the money supply can't grow any faster than people can dig gold out of the ground. Banks couldn't lend as much as they wanted because there simply wasn't much money available to lend. Since money wasn't all that plentiful and there was no good reason to expect more of it anytime soon, borrowers had to pay high interest to get what little money could be had. Sound money which is backed by gold favors lenders over debtors. What's more, with demand for money exceeding supply, there would be no inflation. This sounds good when you look at the price of anything today compared to what it was when you were a kid, but remember that debts are automatically shrunk by inflation just as prices grow. Most middle-class Americans owe enormous amounts in mortgages and credit cards; inflation helps get rid of their debts. The gold standard would kill this helpful force. These issues, well-known to all Americans of the late 19th century, led to one of the most famous political speeches in history. On July 9, 1896, William Jennings Bryan addressed the Democratic National Convention in Chicago. The burning issue of the day was whether to endorse the free coinage of silver at a ratio of silver to gold of 16 to 1 - going off the gold standard by allowing silver to back money also. All the silver in the world could be used to create more money on top of what had been created by gold. This highly inflationary measure would have increased the amount of money in circulation and helped cash-poor and debt-burdened farmers. Do we hear echoes of this sentiment in the many proposals to bail out those who borrowed too much money to buy houses they couldn't afford? Bryan's "cross of gold" speech won him fame, but not the presidency. He won the Democratic nomination but lost the election to President McKinley who ran on a platform of maintaining sound money by keeping the gold standard. Most voters of the day understood what would happen if the government was set free to create money at will. Even with the prospect of reducing their debts, most voters didn't think the risk worth taking. The United States remained on the gold standard until 1934, abandoning it during the Depression when most of the rest of the world did. In the late 1920s and early ’30s, countries clung to the gold standard—backing paper currencies with gold reserves—as a defense against hyperinflation. Gold was thought to be the foundation of sound money, which was deemed necessary for prosperity. Most simply, gold regulated economic activity. When gold drained out of a country, supplies of money and credit tended to shrink; when a country accumulated gold, they tended to expand. But defending the gold standard caused country after country to suffer banking runs and currency crises. These fed each other and deepened the economic collapse. By 1936, more than two dozen countries had reluctantly jettisoned gold. Once this happened, expansion generally resumed. Economists were telling President Roosevelt and Congress that the government should spend money to try to end the Depression. With the money supply limited by the gold standard, they simply couldn't - the money flat-out didn't exist. Abandoning the gold standard allowed the government to spend much more freely by creating as much fiat money as they cared to pass out. Spending the money made available by abandoning the gold standard was supposed to end the Depression as famously predicted by John Maynard Keynes - but just as Obama's stimulus plan utterly failed to restart the economy, so did Roosevelt's. Only when the Second World War destroyed all the other industrial nations of the world, creating unlimited demand for American goods, did our economy recover and the Great Depression really come to an end. Abandoning the gold standard set government free to cause massive inflation by printing money. Suppose you had 100 ounces of gold at the time the government made it illegal for private citizens to own gold and forced you to convert your gold to paper money. It would have been worth $2,700 at the then prevailing price of $27/oz. Seven decades of inflation later, gold hit $1,600/oz. Your $2,700 would buy 1.67 ounces of gold. Your 100 ounces of gold has been reduced to 1.67 ounces through government mismanagement of the money supply. That's why people who have money like the gold standard. The United States abandoned the gold standard so that the government could spend money to "kick start" the economy. That didn't work any better for President Roosevelt than it has for President Obama. Abandoning the gold standard trashed savers in favor of debtors. Mr. Roosevelt's debt was paid off in far cheaper dollars just as Mr. Obama's debt will be. The Chinese know this and are shifting assets from dollars to other currencies. Government spending to boost the economy didn't help in Mr. Roosevelt's time and prolonged the agony in Mr. Obama's time. Most of the Obama stimulus money ended up lining the pockets of his friends; it certainly didn't create many jobs. Roosevelt's stimulus did better - real people did get jobs, and in some cases worthwhile work was actually done - but it didn't accomplish much of anything economically helpful in the near term. Loose money penalizes savers and favors debtors. Since there are generally more debtors than savers, voters will often go for easy money just as welfare recipients go for higher taxes and more benefits. Easy money leads to bubbles which eventually pop, but as we've seen in the last few years, accurately assigning blame simply doesn't happen. The Wilson Quarterly claims that economic expansion resumed when the gold standard was abandoned. It's true that monetary expansion resumed in that governments could print as much money as they liked, but economic expansion didn't always follow monetary expansion. In Germany, abandoning the gold standard led to the hyper-inflation of the Weimar Republic. The resulting economic chaos helped bring Adolf Hitler to power. He fixed the economy, but his platform didn't ultimately work out all that well for most German citizens. In our day, the Federal Reserve has created billions of dollars out of thin air through a process they call "quantitative easing." Economic activity didn't increase and, in order to hide the resulting inflation, the government has played games like taking fuel costs out of the inflation index. Government seldom gives back any power once it has it. The power to print money is such a potent way to reward friends that our government will never go back to sound money voluntarily. Campaign contributions come in faster than inflation, so our officials don't mind. Ron Paul has a very good point about the Federal Reserve system, but don't expect the media, our elites, the wealthy, influential governmental employees who benefit from ever-cushier taxpayer-funded jobs, or any elected politicians of great power to admit it. That pretty much eliminates any likelihood of a change short of armed revolution, which is a cure far worse than the disease. Too bad, Dr. Paul and friends! Question: What if we were to balance our budget and over the next decade shrunk government? It after all does nothing but consume the wealth of the economy. Imagine if you will what kind of an economy we would have if those dollars were allowed to stay in the pockets of the American citizens instead of the re-elction boondoggle projects that we waste our wealth on? I know this idea is fantasy but if it were to happen we would not need the gold standard. The phrase "sound as a dollar" would again be true. I do not think that we can go back to the gold standard for many reasons. If you are worried about inflation then buy gold. The only way to get the dollar sound again is to quit expecting something for nothing from the government. I have read "The Case for Gold", and it documents inflations and deflations under precious metal standards. Mild fluctuations happened for the reasons given by Adam Smith (substantial discoveries of precious metal or lack of such discoveries), but Paul attributes many of the cycles to banking. He does not take the next step: since gold is such a small part of the economy, monetisation increases its economic value, and fractional reserve systems counteract this effect. Already speculation has pushed gold to a historically unreasonable level (50 oz silver / oz gold), and further monetisation could put it beyond most non-monetary use. The resulting money could be highly unstable: its value would fall dramatically with the reinvention of fractional reserves, possibly spiking again in the next banking panic. It's interesting that the article mentions Obama so many times. Bush failed to pay down debt when doing nothing would have produced a surplus. He spent a lot of money on an unnecessary war and responded to one recession with tax cuts which were clearly not intended to be stimulative. He and the Federal Reserve pursued the policies which led to the current crisis, and he proposed the first round of bailouts and other spending in response. Bassboat makes some good points. Sound fiscal policy (not necessarily a balanced budget every year) would in the long run eliminate inflation with no other monetary reform. I think Paul would argue that monetary reform is necessary to ensure sound fiscal policy. I would not buy gold as a hedge against inflation because I think it's already overpriced. (Do buy gold if you believe that monetisation is coming.) I'm thinking about silver or copper, and there are lots of other possibilities.